Cosential’s Central Information Platform keeps your data current, accurate and transparent. So you can turn information into true business advantage. "Mechanical Contracting CRM Implementation & Culture Overhaul"
Make sure that it fits your needs from a module standpoint and the integration with your financial software. Completely transparency of our customer opportunities and interactions between all our divisions for all customers. We have robust reporting where we can understand our pipeline, hit rate, and more data than we ever had in the past. The process is simple and we have the power as the admins to make changes/updates without having to wait for the resources at Cosential. We feel very empowered! I really like that new features are always being developed and released. There's the Outlook add-in which is super simple to use. I also like that Knowledge Management and Publisher is available in the program as well which can lead to even greater collaboration across the business. Cosential always listens to client input and uses that input to improve the product. The administrative functionality for the various modules could be consolidated or located a little better. Sometimes it's difficult to remember where all the administrative functions are. Cosential has allowed us to have one system for the entire business for CRM functions. Previously, we had different parts of the business using spreadsheets or legacy systems with no visibility company-wide. This led to incomplete reporting and extra work for staff to put together comprehensive reports. We've also saved money by eliminating those other programs now that we have onboarded all of our divisions. I look forward to implementing some of the other modules as we go forward. "Good CRM & Proposal Builder but horrible email automation capabilities"
Fairly easy to use and setup with decent reporting and proposal building capabilities. The email marketing module is absolutely terrible. Email templates take forever to load and preview so editing them is so time-consuming as to be useless. The fact that we were sold this capability that didn't actually work caused us to ditch Cosential altogether. If you are considering the product for its email automation capabilities, have the sale rep perform a live test of the feature making 2 - 3 sets of email template revisions. Grab a few cups of coffee while you wait 90+ seconds each time a new view of the template loads. We were trying to get better live reporting for our sales efforts as well as limited email marketing automation to increase requests for SOQs and proposals. After 2 months of use we were so frustrated we changed CRM and sales pipeline management to another product. "Cosential keeps company wide proposal pieces accessible and up-to-date with minimal fuss/effort." My favorite feature is the resume generation tool. The ability to produce multiple resumes tailored for specific pursuit types automatically updated each time they are created is beyond wonderful. Coupled with their availability to all team members 24/7 at the push of a button from any internet enabled device makes the resume generation tool peerless. Another great feature is the opportunity tracking – once again keeping all the pieces of a pursuit in one handy place and available 24/7 is brilliant!!!! Attend the webinars - get as many people trained and comfortable with the software as you can. Consistent, accurate resumes available company wide with reduced labor hours to create them!!!! Thank you for this review Wendy, we are tickled pink to hear that you and your staff are using the system to its capabilities and feeling the impact of the time savings the tool is designed to deliver. Your wish of allowing others to upload templates is actually possible, it just takes an existing administrator like yourself to assign the necessary permissions. We will be reaching out very soon to walk you through it! In my hectic life at work, it has been such a pleasant change of pace to have requests I do not have to track and questions I do not have to follow up on. The team at Cosential has proactively reach out to me and responded to needs and requests so quickly! They have a great range of services to assist and guide me. The webinars are highly beneficial - I strongly recommend all of them. Attending the webinars has helped me realize Cosential has so much more to offer than what we are currently using it for. Love the personalized emails - they reassure me that I am in good hands! Ask for help from the Cosential team for any and all questions. Do not waste time struggling to figure out the setup and use on your own. We are tracking leads and opportunities currently. We will be increasing our use of Cosential in 2018 to help us build stronger relationships with past, present and future clients. Cosential has helped our marketing/business development team stay on the same page and on task. Thank you, Amy, for your feedback, especially regarding your experience with our Customer Support team! We're not shy to recognize it's come a long way and we're more than elated to hear it objectively that the results of growing this team in recent years is paying off for our clients! Keep us honest and working hard for you, and we wish you and your firm a solid 2018, measured with Cosential! "Good but lots of room for improvement"
I like that we can customize the program to fit the data we are gathering. I also like it does store the data we are looking for and needing to store. It is nice to have the data come out in customized templates although they have their quirks. I dislike that it is a manual entry if you don't use the CRM component of Cosential. If you don't use the CRM side of Cosential, there are fields you can't hide. I don't like you can't reorder the tabs. Also, the templates are difficult to customize and still have to be tweaked even after you export the data. We also don't have the data integrated and just use monthly uploads to Cosential because of the effort it would take to integrate with SAP since we don't use the CRM side of the program. Understand what it currently offers and not what the salesperson says it does or will offer. We have a place to store project and resume data including photos across multiple office locations. This means fewer phone calls and emails and more up to date data for marketing data to clients. It also means we are able to communicate updates and have the most up to date information from resumes and project data as often as the users or administrators update the data. "Empowering our BD and Marketing Staff!" I love being able to see the history of our opportunities and have an at-a-glance understanding of where we are on certain pursuits. It's empowering to have that kind of information just before walking in to a client meeting. Additionally, the publisher module has made a world of difference in increasing the quantity of our marketing qualifications output. Having a simple way to wrangle our data, tailor it to client needs, and then publish directly to our branded format has saved us hundreds of hours in production time. We have also really enjoyed working with Oscar and Amy-- they have been been wonderfully friendly, patient and positive with us as we clear the initial Cosential learning curve! Tailoring our reports and finding the right field locations for tracking financial projections has been more challenging than expected. Using the Opportunities and Workflows in Cosential, we have been able to automate our project job number request system with accounting. Accounting now has the information they need in one succinct email and can proceed with opening project numbers for our engineering staff right away without a lot of time-consuming research and follow up. Thank you Crista for this energizing review, fuels us tremendously and great to hear we're helping you optimize your marketing qualifications output! Glad to hear our AEC experienced staff is treating you well, we love the industry! 100% AEC, nothing else, so we get it! On reporting, totally get where you are coming from, and understand the reporting possibilities can be robust. Don't forget that free access for help is at all of our client's fingertips, just email success@cosential.com or call us up when you're making a report and need assistance, we'd love to help, and learn from your needs. That is where we get development ideas, all from clients like you! "Makes my 1-man marketing department feel like 3"
Improvements could be made to the 'knowledge base' section. The mobile app has been troublesome on my Android phone and tablets. Spend time at early implementation to verify your data is correct and clean before beginning your import. As mentioned in my previous description: I no longer spend hours "looking for *stuff*" (put politely) during proposal preparation due to the full featured project and ‘knowledge’ database paired up with the advanced reporting functionality. Tracking opportunities and my pipeline from a single page is a huge time saver. My goodness Miles we're blushing! ROI is what it's all about, and we are glad that not only you see it but you preach it. The hardest part of adopting a CRM is deciding to - we hear that all the time, but as you state here once you take that step and see the light you wonder how did you ever operate without it, right? On your metaphorical iceberg of features comment, which we take as a massive compliment, don't forget to call into customer success or attend our weekly training webinars. Be sure to look at the schedule and sign up for the ones that align with your desires, take things step by step and we stand eager to help you 1:1 anytime. Be sure you have the latest version of the mobile app! We've made quite a few revisions recently with more to come, so be sure you update it when prompted and/or go ahead and download the latest version - contact us with feedback so we can make it better! "Cosential provides top notch customer service. " Take the time needed to get your data cleaned up during implementation. Use the financial data connector to connect to your financial system so that project information is accurate and loaded into the system automatically. With multiple offices, knowledge sharing is a huge issue. Cosential provides one home for knowledge on our clients, projects, staff, etc. "Cosential Has Helped Improve our BD and Marketing Processes"
Cosential is an all in one platform that has addressed our business development and marketing challenges. We like having everything in one system. The implementation and training support has been outstanding. Lisa Pitts was amazing to work with during the process. She helped make the transition from our old CRM to Cosential virtually seamless. We are struggling with the Card Reader Application, but the team is addressing the issues. Overall, we have found Cosential to be an outstanding tool. The support team has been able to address any challenges we have experienced. Continue to focus on developing the marketing automation tools. Having all of our account, contact, and opportunity information and history in one place has been valuable for our sales team. We are just starting to utilize the Proposal and Marketing tools. We are impressed with the ease of use and power of the system. This is an AEC CRM built by people who understand the AEC business. "One stop shop for all of our project and pursuit information." I love how easy it is to access and analyze our information. Cosential has a home for every data point you can imagine -- and the flexibility add new ones as needed -- so you can store and recall information about all of your pursuits and projects. Be sure to work VERY closely with your implementation specialist. Launching well is essential for others to buy in. Our biggest problem is that knowledge about our projects, clients, past pursuits, etc. lived primarily in the heads of our people. That's fine as long as no one leaves and no one forgets...but that clearly isn't reality. Cosential is a robust, interconnected database that allows us to have literally everything in one place, and we can view that information from multiple perspectives. Thank you Amanda for the feedback, details and your business! We're very proud to have earned positive marks from you and work hard to improve. You are correct in that we've vested, and continue to vest in infrastructure to improve performance. Equally spot on with implementation, it's not easy implementing any CRM so we set milestones and tasks to guide new clients along, share best practices both from an industry perspective as well software. I have used Cosential now for over 10 years, and I can't imagine doing my job without it! Not only does the program provide complete CRM tools, it is a powerful relational database specifically structured for the AEC world. I use it to consolidate all the information I need for responding to RFQ's and RFP's: information on our personnel, consultants, and projects. It's fast, intuitive, and has a powerful report writer that allows me to pull out necessary information in seconds. Better yet, the company continually improves the software and adds in new features at no additional cost to its clients. The system has saved me hours previously spent searching for information, and data is accessible more quickly than it can be found on our servers. Keep up the good work! Anything I have disliked or found missing has been addressed through customer support. Benefits include having one single source to find out any type of company information on contacts, projects, employees. Makes assembling proposals and answering odd questions much easier. Will be expanding our use of the very detailed CRM features this next year. "A slow and steady implementation with great support from Cosential has been a great experience. " Being industry specific has been helpful in many ways. Having Jan and Lisa, my support contacts, has been a critical piece to implementing a CRM into a company of 250 people and 7 offices across the country where no CRM existed before. I've been a user for less than a year and even in that short period of time I've seen a continuous effort on their part to improve the platform and the user experience. My confidence is there that things will continue to improve and develop over time. There are many pieces to the system, not all of which are well developed. There is also a small consistency issue from screen to screen and module to module. You can tell the system has been in development over a long period of time because you have newer interfaces and older ones depending on where you are. I wish the live chat worked in the support center. That would help for those quick things that I need. Disparate systems for tracking company contacts and sales opportunities is the big one. The marketing component will be a part of our 2017 plans. Now that all of our data is in a single place we are starting to see benefit we didn't imagine. It's an exciting time for the company as we look to grow in size as per our 2020 plan. Thank you for the great review and feedback! Good to see you are experiencing & seeing our UI / module updates being rolled out, we're making progress and have lots more on the roadmap! Also, please know that our live chat on cosential.com is for anyone, clients and those curious, so please ping us anytime on that for those quick things, or even not so quick. Bring it on! "Highly Recommend Cosential for AEC Users"
In the ten + years I’ve used Cosential, I’ve been a reference often and I always remind clients and potential clients that Cosential isn't perfect, they have their flaws, they are human and can drop the ball but overall I have found them to be the BEST option for a marketing database for AEC firms. I used Cosential for the first five years of my career as a marketing coordinator at a construction firm, then I transitioned into a CRM Manager role. This company used CMiC for accounting and I was involved with the FDC which connected data from accounting to Cosential. I left and did CRM for a national engineering firm with 16 offices that used BST for their accounting system and was responsible for their FDC. After two years, I went back to construction and was the CRM Manager and implemented the FDC for them and they were on ViewPoint. I started my own consulting business in May and use Cosential for my business development / marketing needs as well as workload management. The best thing about Cosential, in my opinion, is it's diversity. I like that some use it extensively for the CRM component, others for the proposal automation and some for the opportunity/profit projection. To those clients that is what Cosential does well which to me says they do it all well. Cosential is self explanatory and is an 'out-of-the-box' solution. However, if all modules are left turned on I do think it can be overwhelming. It has so many options and modules but you can narrow users focus to just what the user needs which makes it easier to navigate. Implementing a new CRM is not easy. Cosential has tweaked the implementation process, and streamlined things well so the process and steps to follow are clear. However, know that your implementation specialist is busy, so as a client you need to own your part to drive things forward. It’s like working with a trainer - you have to do your part, the trainer can only instruct. Once you get going you’ll see results but you have to stay focused; if you fall behind or get off task it’s understandable, but know that you have to hold yourself accountable to get back on schedule. Finally, in year's past I use to say that Customer Service was an issue but in the last year things have really turned around with the hiring of new staff. This has resulted in quicker ticket resolution and increased communication. Know what you want out of Cosential so you can successfully setup your account. Stay on track with the outlined implementation process and ask questions often if you don't understand - as with anything don't assume. I use Cosential for business development efforts, opportunity tracking, hit rate and win rate calculations, project data and reporting. "The ONLY software in the AEC industry that makes my job easier! " Because Cosential was designed by marketers in our industry, they know what information is important to collect, track, and analyze. The organization of the information and ease of use of the system is unparalleled to other CRMs/databases. Cosential is constantly updating and enhancing the system, so there are new, and improved, features being released to its users constantly, and I always hear what's going on - I know it's the top of the line database for information junkies like me. The reporting and template publishing tools are also incredibly helpful. It's the best in the industry, but implementation (as with any software), can be very time consuming and overwhelming. Depending on your level of implementation, I would highly recommend a dedicated employee to this endeavor, and then can become the go-to Cosential person/administrator for the system ongoing. Even after implementation, you need to understand any database is only as good as the information that goes into it - so constant maintenance is imperative to keep the system updated and accurate. Tracking our proposals and showing our win/loss ratios to senior leadership has been crucial. Also, the ability to store less-than-popular data for possible future use is highly beneficial. Thank you for this feedback and your advocacy, this is very rewarding to read! We love to hear the validation of our purpose: providing the best database tool that truly knows the AEC space and consistently driving for innovation. Our goal is absolutely to make your job easier and more business for your firm! When it comes to reporting, implementation we hear you, part of housing so much data for inquiry is also a having numerous ways to summon it, look at it from different angles. We're always working on the UI for ways to improve, as well ensure we remain extremely approachable for assistance should you need it. We find that our weekly webinars, local user groups and user conferences really help you get from Novice to Pro, so be sure you are involved with them! The program is easy to use and great customer service. I was able to book an appointment with someone right away to teach me how to integrate indesign into cosential. The one thing I would like to see changed is the dollar figure automatically rounds to the millions. I have used Deltek Vision before and this system is much easier to use and better customer service. How to keep all of our project information into one system and use this to create project sheets and resumes. Cosential team has gone above and beyond again and again to help us accomplish a successful launch. They have helped me develop a good understanding of the product and I feel ready to support my team and office users. We have not run into any problems to date. We envision Cosential helping take our Business Development to the next level. Currently we have nowhere to store all of our pursuit data. The data we are storing isn't easily manipulated by our BD and marketing teams. Having the data more accessible is going to make a huge difference. "Cosential is a must for AEC companies!" I really appreciate how well Cosential's structure and terminology relate to the construction industry. This is a huge plus for me since I implemented while being over sales and marketing for our electrical contracting firm. There are what I would call basic actions in the workflow module that are missing. For example I would like a workflow to trigger a calendar invite for management to review bids prior to submission. The mobile app needs work. When using mobile version I will login through safari's browser and the user experience is much better. Make sure to review internally your business development process flow. While mapping this out you will figure out who all needs to be involved internally and this will give them chance for buy in. I think this is crucial for quick adoption by coworkers and it will help you articulate what you need to your implementation specialist. As manager of business development I am able to keep our operations management informed on our rumor mill and the availability of opportunities in a specific market. Our operations managers are able to understand the effectiveness of our bidding strategy by reviewing win/loss opportunity reports. Once the operations managers see how easy the opportunity grid is to navigate they can quickly create their own views of data and export out to excel for further manipulation. Our estimators involvement as CRM users allow us to assign opportunity IDs and keep all the data organized and available company wide. This allows multiple people to follow up on opportunities that otherwise would be won by our competition. "Cosential's customer support is wonderful." The industry specific knowledge of Lisa Pitts, our implementation specialist. Her background on construction business development and marketing made her extremely intuitive about our needs. It would have taken months or years to understand the nuances of simple administrative setup decisions. Hands down, Cosential's customer support is the absolute best in the industry. There is nothing at this point that I dislike..
We are able to have clear insight into our pipeline, wins, losses, and make connections that were not available to us before adopting Cosential. One place to locate information shared amongst many. Sandra, we're so fortunate to have your business and testimony, we're such a fan of yours as well. Love the "mind sharing" phrase - that is our goal, to help firms avoid storing data all over the place and save time. If you are in sync, you are saving time. If you're saving time you're getting more done, winning more business. Thank you for the review and please hold us accountable to ensure we maintain your value and satisfaction! "Cosential is a powerful tool that is making our marketing professionals more efficient & productive." Sometimes the responsiveness of Cosential with our FDC is not ideal; we are working to make the reporting query fields more customized for how we use them. Cosential can have a lot of fields to sort through but can be scaled back by administrator; must be careful when switching between projects when more than one project is opened in different tabs so you don’t and end up editing the wrong project. It is a great tool that will make your team more efficient, as well provide accurate data for quality documents. The easy of creating reports, exporting resumes and exporting project data sheets that contain real-time, accurate information is invaluable. Efficiency; accuracy of data; data collection process for new projects, completed projects and new hires; quickly generate project sheets and resumes with dependable/reliable info; quick and easy reports to assist in go-no-go decisions as well as team selection for pursuits. I have worked with other enterprise database systems and been "left in the cold" throughout the process. Cosential collaborates all the way thru. Our Implementation Specialist, Lisa Pitts, is knowledgeable about the system and our industry practices. We speak the same language! which makes everything even easier. Top notch!! As we are still in implementation currently, nothing. Very happy to date. still in implementation. this will help our CRM and Marketing professionals become more effective. We love your energy and enthusiasm Susan! What's exciting about your post here is your recognition that our implementation staff understand your processes, and as you stated speak your language. Our industry is unique, and because of this we only hire folks who have been in your shoes to get you and your staff going. That way you never have to discuss the "why", and we focus on the "how" and you get going faster! Thank you for this review and we look forward to helping your staff become more effective & winning more projects for years ahead! "Cosential - Work SMARTER Not Harder!" Built by and for the AEC industry. The workflows are a huge time-saver and allow us to capture the data we need to make our systems function. Nothing major - I love their reports, but they can take some getting used to. You will need a Cosential Champion and they will need support from the top! We used to have to pull and drag project information out of our Project Managers after their projects were completed, while they were already working on a few others.... Now with the workflow and Financial Data Connector, we are able to sync our financial projects directly into Cosential project records and pull relevant data real-time. "Cosential is amazing and addresses all of our needs!" I think the web interface and the ease of use. It is accessible from anywhere and saves our firm a ton of time. There isn't really anything that I dislike about Cosential. Most of our issues have to do with users actually doing what they are asked to do. Truly is amazing for the AEC industry. Reporting, opportunity tracking, employee information, general marketing information, and CRM. The information that marketing is responsible for maintaining is always up-to-date because of Cosential. Regardless of what firm a person is in, they have access to all of the information that they need to find. Cathy, we're so flattered with your comments and feedback! It's an honor to have earned your business and we're privileged to hear how our solution is helping you save time which means you have more time to win more business. "Decent Software for large AEC Firms"
I would really compare the needs of the organization in comparison to the items available in Cosential. While Cosential has a lot to offer, for some it may be overwhelming. I would suggest a firm have a dedicated database administrator to main this product. "Excellent Marketing/Business Development Tracking for General Contractor!" The whole experience has been a breeze. From the first sales contact to the support while setting up the program to fit our needs has been amazing. After sourcing out other CRM programs, Cosential fit best for us and the customization is great. There are a couple of areas that would be better suited for our needs if the customization was available. But all in all, the program works great for us and is getting our tracking on track!! The dashboard and workflow system are excellent tools. As a very visual person, the ease and impact of the dashboard widgets are a great. Seeing your information in charts and graphs really help to monitor our marketing progress. The automated alerts and notifications from the workflow system are excellent as well. Easy and efficient way of letting the team know when there are new prequals, awards, proposals, etc. Kayla this fuels us, and we cannot thank you enough for sharing your testimony on how Cosential provides value in your role as well to your organization. This testimony is what we're after, with all of our clients, and we work hard to bring this user experience to all of our customers. Our customer service & eagerness to please does not end at sales, nor after implementation. Keep the customization suggestions coming, this is how we innovate and ad new features & updates every week! "Sort of clunky database software." Web interface, lots of potential, but I don't harness it as well as I should. Kind of clunky UI. Slow to load results. Takes a while to figure out. I'm still doing it. Database for our company projects, etc. Thank you very much for your feedback, Shay! Cosential offers free Customer Success and Support to help our clients harness and control the power of Cosential, and configure it in away that meets your individual needs based on your specific role and use case. We'd love the opportunity to help re-configure your personal Cosential experience to keep it from feeling clunky. We will reach out to you to offer our assistance, and of course please email success@cosential.com anytime when you need help. It seems to be really slow sometimes resulting in errors when I'm updating something or uploading a file. I highly recommend Cosential as long as you actively use it and enter as much information in it as you can. I don't know if you'd call it "solving any problems", but our marketing/business development department has been utilizing Cosential's opportunities and project modules for about 6 years now. We've been able to add a plethora of information into both modules making our proposal process more efficient and much more smooth. Thank you for the kind words, and your being a fan of the solution! It fuels our spirit to hear how we save you time in the proposal process, making your job easier is our job ! On the tendency to run slow running updates, we've purchased more servers in addition to optimizing the application. We're already seeing great improvement and very near upcoming updates are focused on delivering much faster speeds - something we will never stop improving upon, so watch for updates and let us know if you're not seeing improvements on your end. I like that it exists the best. I like being able to make reports and save them in excel to send my newsletter out.i like the search feature, and lately the call log. It happens that when I put a person in, it may not stick. never figured out why. Cosesential is ESSENTIAL. i find myself going back in several times a day, every day. Managing my project information. the database is essential for grabbling information, as long as someone put it in! Thank you for these great marks! Love that you said "ESSENTIAL" - did you know that our company name Cosential was derived from combining the two words "Cooperation is Essential"? You just validated our name! Be sure you contact support for help with any issues you see when entering people, we're eager to help and learn what may be going on in your case and figure out that "why" for you ! "The number one tool for the Construction Industry." This software program is cloud based so I like that I can access my database of information from anywhere. The software is user-friendly, intuitive and the developers thought of pretty much everything. The interface can be a bit confusing and the program requires a bit of training. Proposals automation is achieved by the ability to store information, pull reports, and update as we go. "An excellent CRM for the AEC industry"
Web-based and is user friendly. Good support. Report writing is sort of hard. Mobile app could be better. We are using it to manage a pipeline of $3.0B worth of leads for a national construction firm. For firms that have regional sales people in different locations, this tool is great. Its very user friendly, you don't get lost with finding your way around when searching for information. Nothing actually, its very easy and pleasant to work with. Reports are done and pulled with ease. Would rank it very high when looking for such a platform to manage anything. By far it has been the easiest and most productive software that I have worked with in years. Storage of company information from in house to out of house. Great with contact information and project management. Thank you for the review, and for using Cosential! We take great honor in your feedback. We're constantly reiterating, making improvements to keep you satisfied. We understand how important it is within the A/E/C industries to share data in & out of the "house", as well platforms, and take your comment regarding as motivation to keep innovating the functionality across devices and platforms. Very best to your firm and thank you again ! Great tool as a CRM and proposal writing tool. Somewhat difficult to customize reports. Cosential is a CRM and Proposal tool that has helped streamline our processes. "The best part of my job!" Designed for the AEC industry; set-up is already aligned with our industry. Easy to use and customize. I would like to see more customizable field options. Centralized system; a one-stop shop for sales, marketing & business development. Benefit - ease of use. 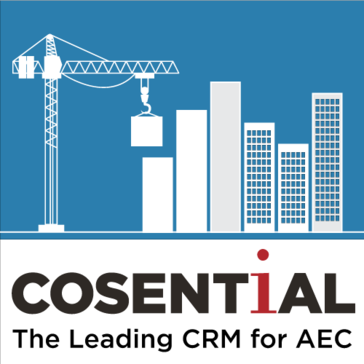 "Cosential The Leading CRM Management Application for A/E/C Industry"
Cosential gives to the Architectural, Engineering & Construction firms a tool to manage all possible business leads. Cosential does have a pretty hefty learning curve and will require everyone to be running on the Windows 7 OS platform. We highly recommend Cosential for firms in the A/E/C industry. This application is especially catered to our line of work where client contacts are not only many but are constantly changing. Cosential helps us track all of this information on-line. Cosential helps our firm to track all of our potential business leads so that we can actively pursue potential clients, setup interviews and ultimately land projects. Thank you for the review and recommendation Paul! We are humbled with your candor, and appreciate your testimony of our tool's place within the A/E/C industries. Sounds like it's helped your firm be efficient and close projects across roles, and to streamline the ever changing contact lists. You have our word we're always innovating to retain that compliment knowing you sell projects, not products, and retaining & sharing data such as contact intelligence is vital within your profession. Out of the box, like any in depth tool there will be a need to customize and train UI for the various users. We've made tremendous investments within our integration process over the last few years, as well to ensure that we're OS & device agnostic. We integrate with MS Outlook, financial systems and most of the industry-specific third party applications within the AEC ecosphere, and hope to hear from you if you have any ideas to "keep our sword sharp" in these zones. Thank you again for the review and very best to your projects! * We monitor all Cosential reviews to prevent fraudulent reviews and keep review quality high. We do not post reviews by company employees or direct competitors. Validated reviews require the user to submit a screenshot of the product containing their user ID, in order to verify a user is an actual user of the product. Hi there! Are you looking to implement a solution like Cosential?